This entry was posted on October 7, 2012 by Tinteán Editorial Team/EMcK, in News. Bookmark the permalink. A thirty year search finally came to an end when in February Margaret McKeown posted a message on the Loughrea parish message board from her home in western Australia asking for their assistance in gaining access to the locked Carmelite Abbey ruin in Loughrea, Co. Galway. Margaret’s many years of research had brought her search to the Abbey graveyard where she hoped to visit the graves of her great-great-grandfather, Dr. Martin Daly Nowlan (whose family came from Gort), his wife Maria O’Kelly and Maria’s mother, Margaret O’Kelly of Creeraun. The local Ireland XO team was only too delighted to contact Fr. Bernard Moran, the caretaker of the graveyard for many years, on Margaret’s behalf and arrange entrance to the locked ruins. Because the grounds of the Abbey are quite dangerous and the ground is unstable, it is not generally open to the public. The Carmelite community first came to Loughrea in 1300 and since then they have been a treasured part of life in the town. The ruins of the Old Abbey tell their story of the many years of service until the mid 1600s when the friars were forced to disband. To mark its long history, Mass is still said on July 16th each year in the ruins of the old Abbey. On arrival in May in Loughrea, Margaret and her husband met with Father Bernard in the atmospheric ruins surrounded by graves. 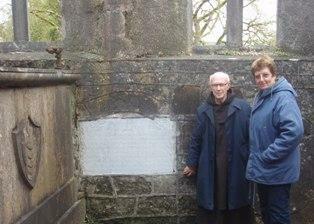 Thanks to Father Bernard’s organisation, the stone plaque set into the Abbey wall had also been cleaned for the visit and the inscription was clearly visible.To Margaret’s great surprise, she discovered that this was also the burial place of her great-great-great-grandparents, Andrew and Eliza Nowlan (nee Daly). With the help of the Ireland Reaching Out team and Father Bernard, Margaret ended a thirty-year search to locate the graves of her Irish ancestors saying the ‘whole experience was very moving for me and one I will not forget’.